The European Union has today approved an updated set of binding standards for power plants, which include new, stricter pollution limits. In the Western Balkans, planned new coal capacities are most likely to be affected by the updated regulations. The Pljevlja power plant and mine in Montenegro. 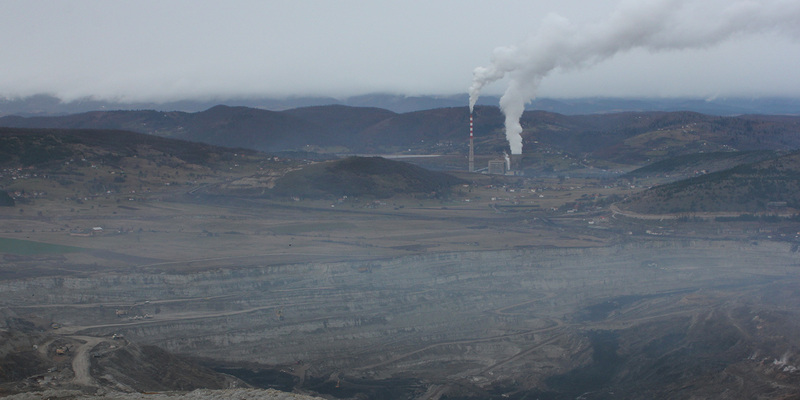 A planned second unit at Pljevlja will most likely be affected by new pollution limits of the European Union. The European Union has today approved an updated set of binding standards for power plants, which include new, stricter pollution limits. The standards, known as the LCP BREF , were adopted today by the IED Article 75 Committee . These standards do not address CO2 and other greenhouse gas emissions, and therefore would not help countries meet their obligations under the Paris Agreement. Yet, once implemented, they will help prevent thousands of premature deaths caused by air pollution from coal power plants , by restricting emissions of sulphur dioxide, dust, nitrous oxides, hydrogen chloride, hydrogen fluoride and mercury. Several Western Balkans countries already require the use of the EU’s BREF standards in their legislation as a basis for issuing permits. As a result, as soon as the new standards are published in the EU’s Official Journal later this year, they will also apply to new plants across most of the region . Therefore, governments in Bosnia-Herzegovina, Kosovo, Macedonia, Montenegro and Serbia – where planned new coal power plants are most likely to be affected by the updated BREF  – need to revisit investment plans to ensure the project designs are indeed in line with the new standards and consider the possible financial implications. Governments across the Western Balkans urgently need to review their plans for new thermal power plants. If they fail to comply with the new standards they will be landed with expensive investment costs within just a few years. None of the new coal plant projects in the region appears to have taken these new standards into account in their planning. But it would be a lot cheaper for them to adjust the project designs now than to have to carry out retrofits in a few years’ time. Large Combustion Plants Best Available Techniques reference document. This is one of a series of BREF documents for different industrial sectors. The Industrial Emissions Directive (IED) Article 75 Committee is a body established by Article 75(1) of the IED, assisting the Commission in elaboration of implementing acts. The Committee is composed of the Member States and is chaired by the Commission. The Committee adopts decisions on BAT conclusions. All of the Western Balkans countries refer to Best Available Techniques in their legislation but only Albania, the Federation of Bosnia and Herzegovina, Macedonia and Montenegro explicitly refer to the EU reference document. Serbia and Republika Srpska need to adopt these standards as soon as possible to provide clear guidance and increase regulatory certainty for investors.